Wordpress site featuring a custom coded 'Trip Advisor' style reviews system which lets users upload images and rate a holiday from 1-5 stars. The reviews are automatically queued for moderation prior to publishing, and the administrators notified that a new review has been submitted. 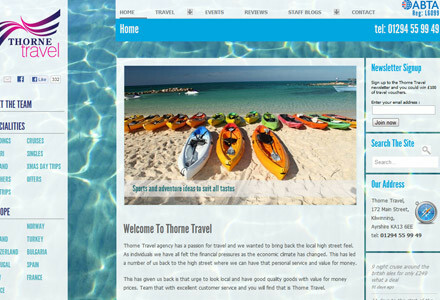 A WordPress site for travel agents Thorne Travel. Thorne are a very customer-centric agency so it was decided that the staff would introduce themselves via a blog, and would also submit their own reviews on holiday experiences. The staff set up Gravatars for an added personal touch, these feed through to the blog posts and reviews. The tricky bit on this site was the custom reviews system. There are a few WordPress plugins out there (some of them very good) that do a very basic job of offering a submittal form which is run through the comments engine. That’s fine but the requirement was for the users to upload up to four images, which would be resized. Naturally this means there are extra layers of validation required, but I also plumbed in a dashboard notification/link in addition to the auto email notification. Finally there is an AJAX based Day Trip section which allows users to dynamically filter the trip offerings by scheduled date using a drop down menu.